St. Paul Regional Labor Federation President Bobby Kasper joined a labor delegation to Rep. Jason Lewis’ office to oppose the tax scam Dec. 6. With an unsettling lack of bipartisanship or debate, Republicans in both the Senate and House of Representatives have passed sweeping measures to reform the U.S. tax code in ways that would rig our system even more favorably toward corporations and the rich. Now, Congressional leaders are working overtime to get President Trump’s signature on the tax scam by Christmas – a timely gift for 1 percent. But while Republicans look like Santa Claus to their wealthy corporate donors, the rest of us see the tax scam for the Grinch it is: a massive and deeply corrupt giveaway for millionaires, billionaires and corporations. The numbers are mind boggling. Under both the House and Senate measures, the richest 5 percent of Americans would receive roughly half of the benefits in 2019, according to an analysis by the Institute for Taxation and Economic Policy. The top 20 percent of earners see about 70 percent of the benefits. The House bill would eliminate the tax on corporations’ offshore profits – basically a subsidy to companies that outsource jobs – at a cost $205 billion over 10 years. And in a heartwarming effort to leave no millionaire behind, Senate Republicans targeted tax relief to folks in the market for a private jet, as well as those who inherit between $11 million and $22 million – provisions sure to delight the president and members of his jet-set Cabinet. While Americans in the highest tax brackets are virtually guaranteed a tax cut, the rest of us are not. In fact, this Republican version of a tax cut actually raises taxes on millions of Americans. ITEP estimates a third of Americans in the middle-fifth of taxpayers – literally the “middle class” – would pay higher taxes under the Senate bill, a result of policy changes that would make it harder to deduct medical expenses, local taxes and more. By the government’s own estimate, the Republican tax scam would add over $1 trillion to our deficit over the next 10 years. (Remember that the next time a politician tells you there’s no money for health care, schools, veterans’ services or other priorities!) Republicans, it seems, are only interested in fiscal responsibility as an excuse for cutting Social Security, Medicare and Medicaid, which is exactly what some members of Congress are already talking about doing next. In fact, the Senate measure would force an immediate $25 billion cut to Medicare and leave 13 million Americans without health insurance. Republicans are meeting plenty of resistance in their effort to sell out the middle class. 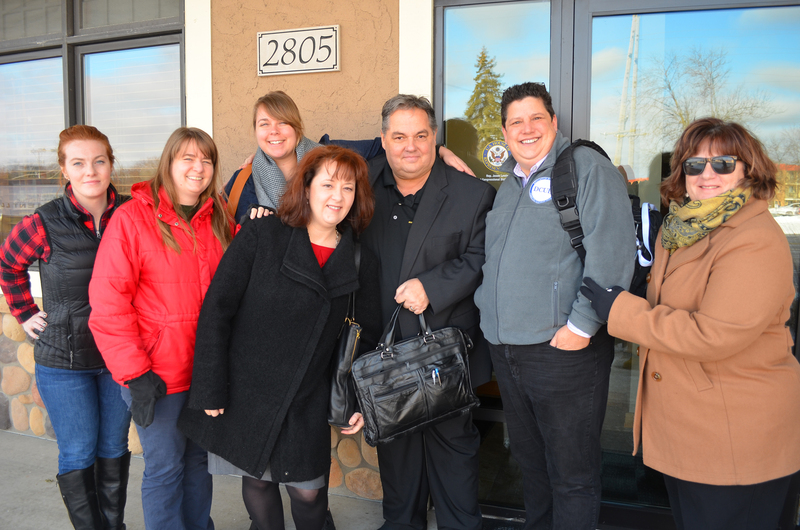 I led a delegation of labor leaders who met with a member of Rep. Jason Lewis’ staff in Burnsville earlier this month. We told him working people in the 2nd Congressional District want trillion-dollar investments in infrastructure, education and health care – not trickle-down schemes and giveaways for the rich. And as we were leaving the office, it warmed my heart to see another delegation of activists from the district waiting in the lobby, ready to have the same discussion with Lewis’ aide. It’s been heartening to see so many working people, retirees and students sound the alarm about the damage this tax scam would do. Even if most Republicans in Congress aren’t listening, our message is getting through to the public. Polls show the legislation is deeply unpopular with most Americans, who recognize it as the worst example of Washington politicians only looking out for themselves and their donors. Until President Trump puts pen to paper on the tax scam, there’s still time to make your voice heard, too. Call the AFL-CIO’s legislative hotline at 1-844-899-9913, and you’ll be connected to your representatives in Congress. Urge them to reject any bill that makes drastic cuts that hurt working people to pay for wasteful tax giveaways for corporations and the rich. – Bobby Kasper is president of the St. Paul Regional Labor Federation, AFL-CIO, representing more than 100 affiliate unions with over 50,000 members.